in the oven preheated at 190ºC for about 10 minutes, until slightly golden. Combine in a pan the rice, the sugar and the water. Mix well and bring to boil. Simmer for 15 to 20 minutes, until the water is absorbed by the rice. Stir in the coconut milk. Always put the coconut milk at the end to keep all the aromas. 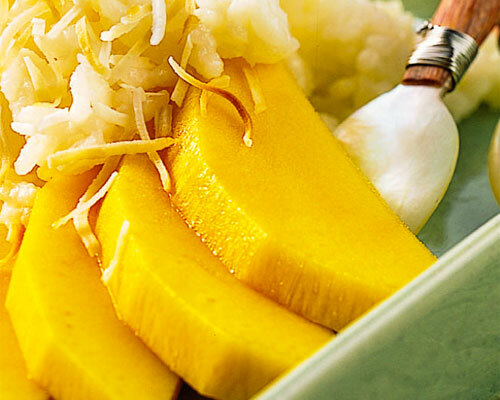 Serve the rice next to the mango slices and sprinkle our oven-toasted shredded coconut on top. Comments: This recipe is loaded with Vitamin A, a fat soluble vitamin that protects eyes, skin & hair, strengthens the bones & fortifies immune system. One serve of this recipe provides about 68% daily value of manganese an essential trace mineral that controls blood sugar levels & prevents osteoporosis. This recipe has a whooping 39% of saturated fat that comes from coconut milk as well as shredded coconut which consists mainly of the lauric acid and myristic acid, medium chain fatty acids, found naturally in mother's milk & is associated with antiviral & antibacterial properties.Inorder to avoid the conversion of excess saturated fat to cholesterol, try to use reduced fat/low fat coconut milk instead of full fat version.